When I was about seven, one of my favourite films was The Phantom of the Opera, the 1925 silent classic starring Lon Chaney as the lonely, vengeful opera ghost. Back then, I didn't much care whether a film was black and white, technicolor, dubbed, musical or full of screaming kids: I just loved watching movies. These days I've become more picky, for which, I fear, read closed-minded. So when I heard that a 21st century silent movie was storming the awards circuit, I was sceptical, but intrigued. Well, here's another glowing review to add to the pile. 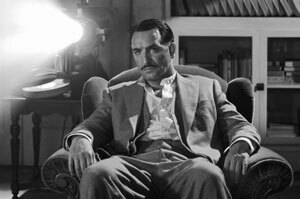 The Artist is a glorious, monochrome silent celebration of everything that's magical about movies, a a melodious, moving love letter to the golden dawn of Hollywoodland. George Valentin (Jean Dujardin) is a titan of the silent silver screen. A chance encounter with a bubbly young ingenue, Peppy Miller (the name says it all) launches her on the road to success until, like A Star is Born crossed with Singin' in the Rain, the rise of talkies casts George's career into the doldrums, while Peppy's star soars stratospherically. Warm and witty, elegant and evocative, at times close to tragic, at others joyously feelgood, I defy anyone not to fall a little bit in love with The Artist. They don't make 'em like they used to? They do now.